It doesn't take much time hanging around photographers before you hear them using the word "stop" in strange ways. Apparently, you can have more than one and you can even have a fraction of a stop--for instance, you might hear someone saying that they needed to overexpose a snow scene by 1-2/3 stops. What is that? A stop is a measurement of a change in the amount of light captured by your camera's sensor, and it's measured in terms of doubling or halving light. Doubling the light entering the lens is an increase of exposure by 1 stop. Halving the light entering the lens is a decrease of exposure by 1 stop. Suppose you take a picture of a beautiful tree with a shutter speed of 1/30sec. If you take another picture at 1/15sec (not changing your aperture or ISO), you've doubled the amount of light entering the lens, so you've increased your exposure by 1 stop. If you take another shot at 1/60sec, you've halved the amount of light, decreasing your exposure by 1 stop. Changes in all three factors that govern exposure (shutter speed, aperture, and ISO) are spoken of in terms of stops. An analogy may help with this concept. Suppose you have a bucket and fill it with water. If you empty out half of the water, you've decreased the amount of water in the bucket by 1 stop. If you empty half of what's left (so it's 1/4 full), then you've decreased it by 1 more stop. Likewise, if you take a bucket that's half full of water and then fill it, you increased the amount of water by 1 stop, and if you fill a second bucket until it's full, you've increased the amount of water by 1 more stop. This kind of vocabulary may seem strange at first, but it's incredibly helpful in photography. As photographers, we always have to make adjustments. We over-expose and under-expose, and we must correct mistakes by increasing or decreasing our exposure. Sometimes we have the correct exposure, but we decide we want a different balance between shutter speed, aperture and ISO. When you adjust one of those factors, you must compensate by adjusting one or both of the other two. The vocabulary of stops allows you to make those kinds of adjustments without needing to do a bunch of math in your head. 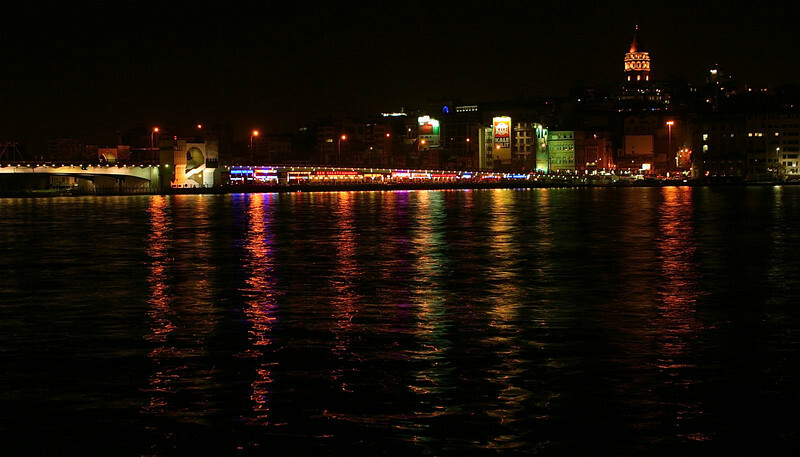 I took the above photograph in Istanbul, Turkey. If I shot this scene with the automatic exposure of my camera, I would have overexposed the scene. It is so dark that my camera's light meter would have been fooled. So I had to manually decrease the exposure by at least a stop to make sure I had the sky black like it looked in the scene. But I didn't need to do any math to calculate my exposure. I simply set my exposure compensation to the value I wanted and shot the picture. "Suppose you have a bucket and fill it half full with water. If you empty out half of the water, you've decreased the amount of water in the bucket by 1 stop. If you empty half of what's left (so it's 1/8 full), then you've decreased it by 2 stops." "If you empty out half of the water (so it's 1/4 full), you've decreased the amount of water in the bucket by 1 stop." Thanks, Jeff. Yes, I agree it was unclear. I fixed it up some.